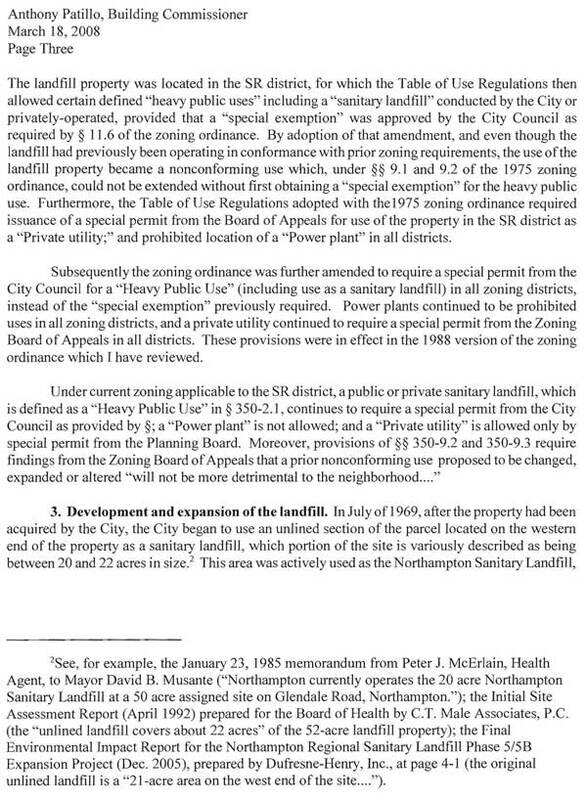 The [Zoning Board of Appeals] disagreed with Mr. Koff and found that the landfill was grandfathered. This decision was appealed and then the appeal was settled. As a result, the ZBA decision stands. No legal precedent can be created by a case that is settled before the court rules on the issues. As it stands, we simply have two conflicting legal arguments: attorney Bobrowski’s claim that the landfill expansion is grandfathered, and attorney Koff’s claim that the landfill is not entitled to grandfathering because it has been operating as a nonconforming use since 1990, when it changed from a local to a regional landfill. 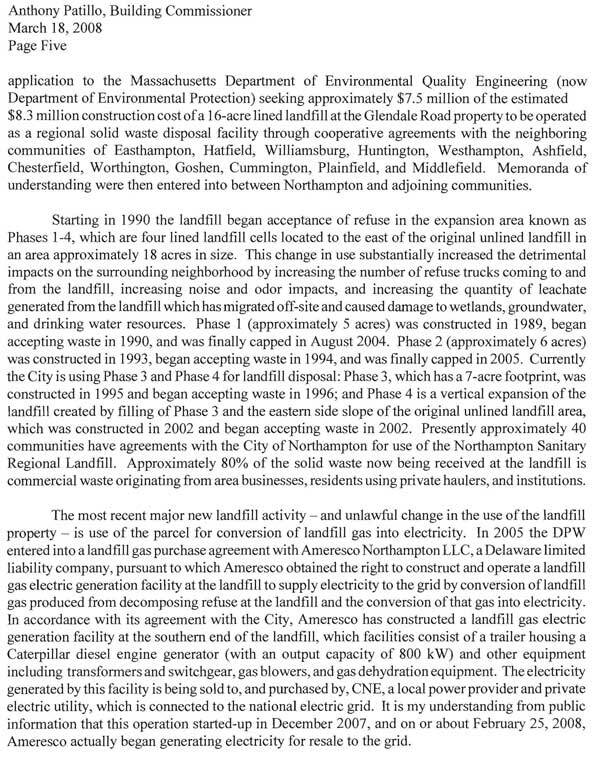 Koff additionally raised the question whether the landfill also needed and failed to obtain a permit to operate a private power-generating utility when the Ameresco deal was signed in 2005. These open factual issues were never ruled on by a disinterested judicial body. 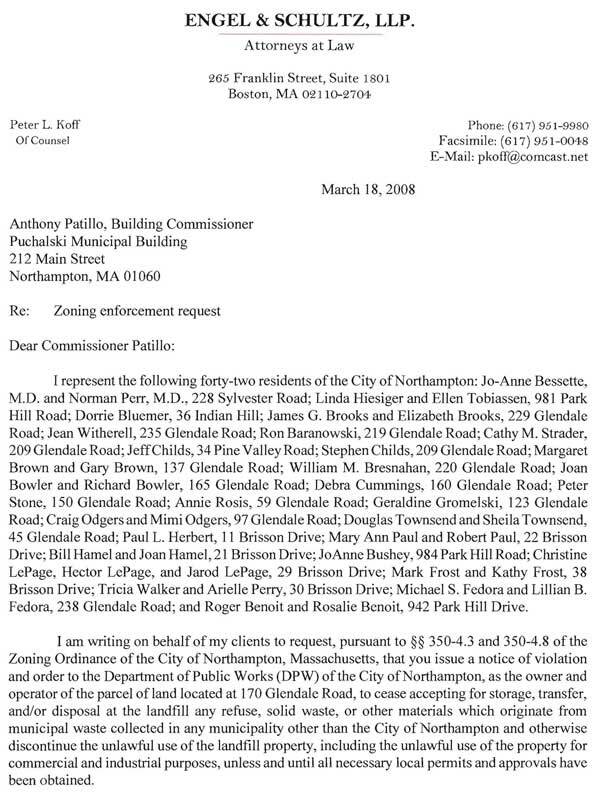 Since Koff dropped his appeal, the ZBA’s decision is binding as to his clients’ request for an order to stop the landfill from accepting trash generated outside Northampton. It does not preclude any other parties from challenging Bobrowski’s sweeping claim that the city council may not exercise environmental oversight over a significant expansion of a heavy public use. If accepted, this argument could seriously gut environmental regulations in Massachusetts. It would certainly be appropriate to ask a court to sort out the complex factual and legal disputes surrounding the landfill expansion. The ZBA does not automatically get the last word. 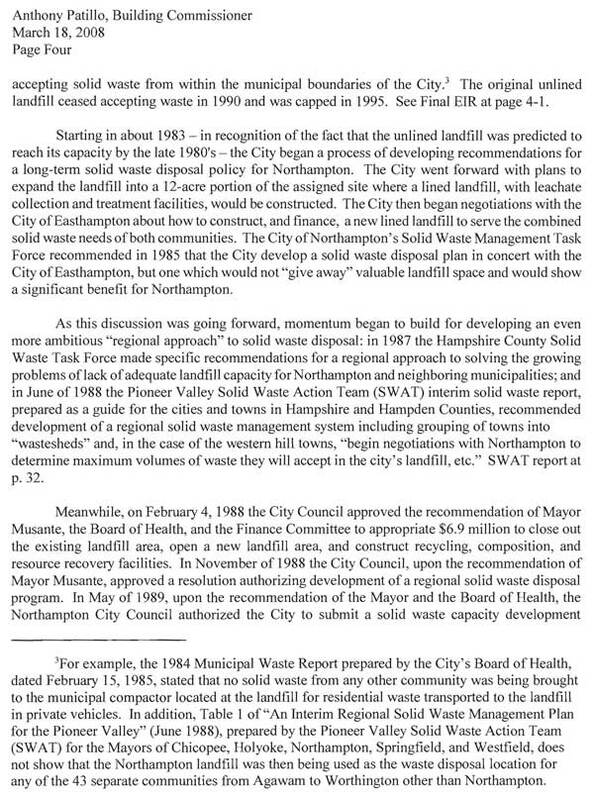 Here are comments prepared by Dr. Jo-Anne Bessette for the March 18 City Council meeting, followed by a history of the zoning of the landfill prepared in 2008 by attorney Peter Koff on behalf of expansion opponents (PDF, 4MB). bypassing the state’s own ban on siting landfills over aquifers. After all these years of a city council self-imposed gag order because of the special permit, what is going on? Political manipulation? Incompetence? The city is trying to clear the road for the BPW to push through the landfill expansion. What do you think of having to get a special permit to put a deck on your house and the city’s new position that the landfill expansion does not require a special permit? 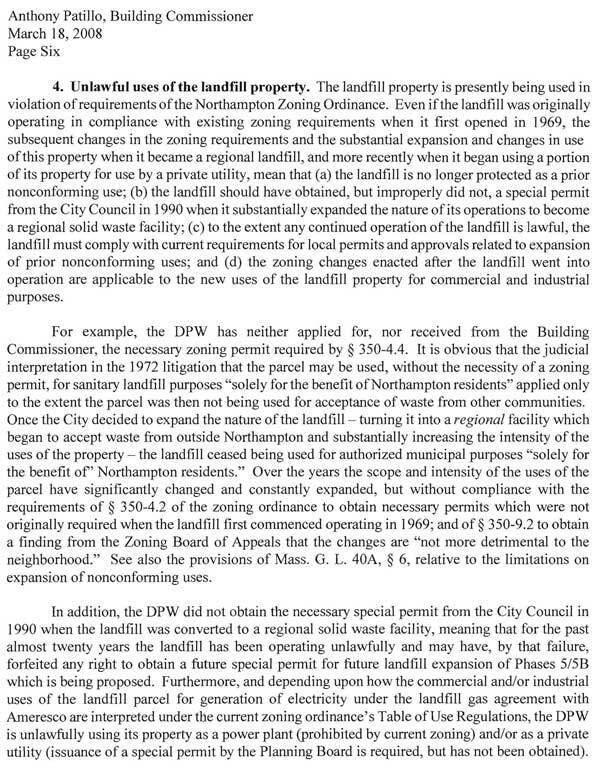 This sheds light on the BPW’s confusing resolution favoring the landfill expansion but not applying for the special permit. What is the true intent of the city council resolution? Is this a way for city councilors who favor the landfill expansion to align themselves with the voters who rejected expanding the landfill over the Barnes aquifer by a margin of 2:1, thinking they will not have to vote on the special permit? Or was it a true and honest effort to terminate the landfill expansion and move on? To pass the citizens’ amendment with the citizens’ language intact, to prohibit all landfills in Water Supply Protection Districts, including the district over the Barnes aquifer. No matter what the city’s current legal opinion regarding the landfill expansion, we expect the city councilors to act in good faith and respect the will of the voters, and pass the citizens amendment. We expect the city councilors to follow through on their promise to go forward beyond the landfill expansion by voting no to funding any requests for money for the permitting process. We expect the city councilors to look at solid waste alternatives independently of the BPW. The BPW has already stated the landfill expansion is the best solid waste option when other reasonably priced options exist. We expect the city council to vote NO to borrowing millions of dollars to fund the construction of the landfill expansion. Northampton voters will find out if they have a government that represents the will of the voters or that rules by fiat. 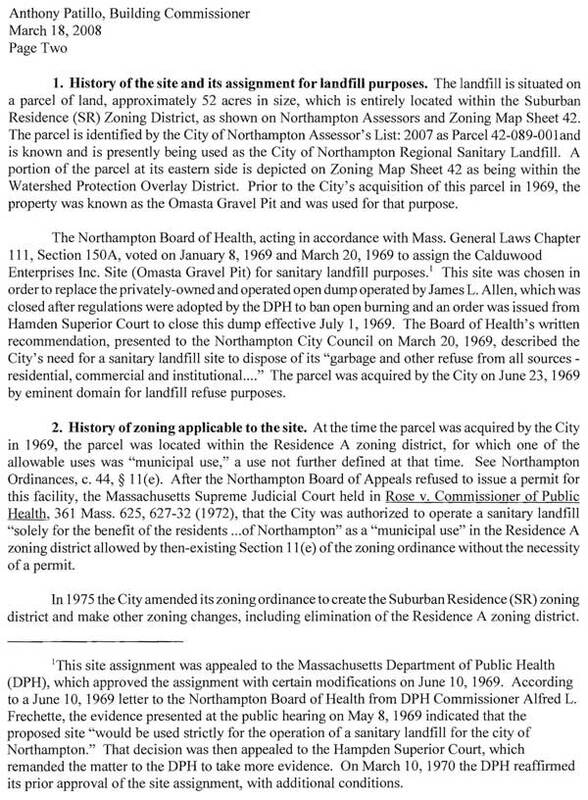 Second, this 2008 zoning enforcement request prepared by attorney Peter Koff includes an analysis of the history of the landfill and its zoning. Contrast it with attorney Bobrowski’s. The opinion of Mark Bobrowski, a Concord lawyer who has written a handbook on land use and planning laws in Massachusetts, debunks a years-held belief that any expansion of the Glendale Road facility would require a special heavy-use permit from the City Council and site plan approval from the Planning Board. City Council President David J. Narkewicz called the memo “provocative,” but he doesn’t believe that the zoning opinion will change the process the city established for expansion three years ago. When Tacy asked about the gag order and wondered if he could talk about the landfill with residents, Pill said he could, noting that the positions of the BPW and mayor and last fall’s referendum vote make the filing of a special permit unlikely. Given the legal opinion about the special permit, [Ward 5 City Councilor David] Murphy said the situation has yet to fully play out. “This isn’t over by a long shot,” he said. Landfill, Ordinances and Regulations. permalink.